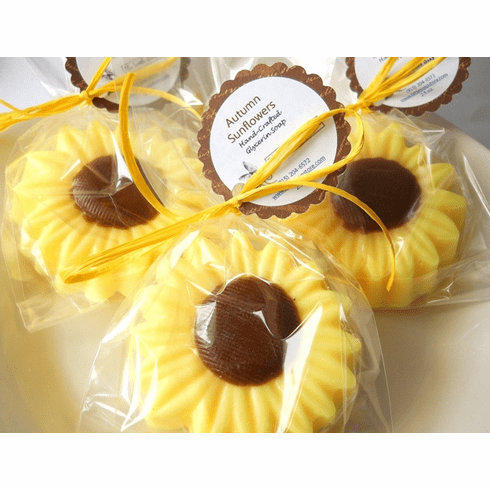 These sunflower soap party favors will be a great addition to your centerpiece at any party! They are excellent for any fall party! Each soap weighs approximately 2-2.5 ounces and measures approximately 3 X 3 X 3/4 inches. Our default set come in the traditional color of yellow and brown and are scented in sunflower. If you need a different soap color, we can do that too. They are made with 100% vegetable glycerin soap that is vegan-friendly. They are wrapped inside a clear cello bag, yellow raffia, and a brown tag. Please let me know at check out what you want on your tag. If you choose a different color palate, I will chose the raffia and tag color to match the color of the soap. Depending on the size of your order, lead time will be about 2-4 weeks. Due to the nature of the product and because these are made-to-order, we do not accept returns on these.